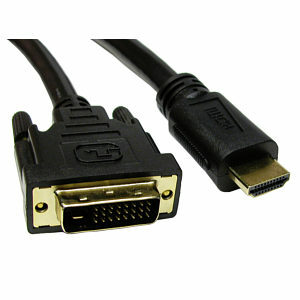 1m DVI to HDMI Cable - Pro Grade Gold Plated DVI to HDMI male. Bi-directional can also be used as an HDMI to DVI Cable. Connectors: DVI-D Male to HDMI Male. Q: Does an HDMI to DVI Cable work either way round? Q: How many pins does the DVI connector have? A: The DVI connector has either 18+1 or 24+1 pins. HDMI is single link so only requires 18+1 pins, howvever the connector sometimes has the dual link pins fitted but they do not connect to anything. 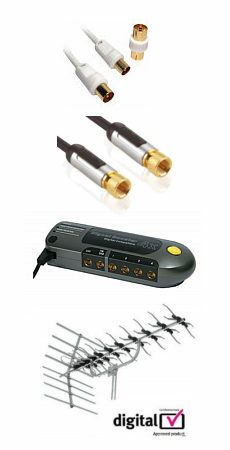 Q: Will this cable support audio? A: DVI doesn't normally support audio however some PC video cards have DVI connectors with audio support. Q: Can I use this cable with a DVI-I socket? A: Yes this cable is compatible with DVI-D and DVI-I connectors as it doesn't have the 4 pins around the horizontal pin. HDMI Mini Switch, 3 Way. Single push button switch for easy operation. Intelligent or manual switching Allows you to connect up to 3 HDMI devices to a single HDMI input. Ultra small measuring just 50mm x 50mm. Powered from HDMI port. Supports HDTV resolutions: 480p, 720p, 1080i, 1080p and 1440p Deep colour capable. Compatible with Blu Ray DVD Players, Sky HD, PS3 XBox 360 Freesat HD, Virgin HD and many more. 8 Port HDMI Splitter, 1 in 8 out. Duplicate an HDMI signal to 8 TVs. Connectors 1x input HDMI female, 8x output HDMI female. Supports full HD 1080P and 3D. Resolutions: 480i, 480p, 576i, 576p, 720p, 1080i and 1080p. High performance 1.65GHz bandwidth. HDCP compliant. Cascadable up to 3 times. All metal housing Power supply included.